Holy Caesar! The 4th of July marks independence from boring salads. It’s National Caesar Salad Day! Last year, we celebrated National Barbecued Spareribs Day. Seemed appropriate, given that Independence Day is traditionally associated with barbecuing. But there’s a very good reason it’s also been declared National Caesar Salad Day: it was on this date in 1924 that Caesar Cardini, an Italian immigrant operating a restaurant in Tijuana, invented the dish. Cardini actually lived in San Diego, but crossed the border every day in order to avoid Prohibition. Because let’s face it, what is Mexican food without tequila? On that fateful July 4 Cardini ran out of the ingredients needed to make a proper salad, so he used whatever supplies he had on hand in order to keep his customers happy. These included whole lettuce leaves, Italian olive oil, and coddled eggs. For dramatic effect – or perhaps to distract diners’ attention from the fact that they were basically eating scraps of food hastily cobbled together – he prepared the salad tableside. And ended up with a surprise hit on his hands. People began trekking to his restaurant not for the booze, but for his namesake salad. Other staff members took credit for inventing the salad, and Caesar’s own brother, Alex, claims Caesar stole the idea from his “Aviator’s Salad,” named because it was served to airmen stationed at the naval base in San Diego. Alex’s recipe was similar, but contained anchovies. Nothing like a little family drama to cloud a happy moment, huh? While nobody can say for certain who came up with the first Caesar salad, Julia Child claims she enjoyed a Caesar’s salad while dining at Cardini’s restaurant in the early 1920s. Ha! Take that, Alex! 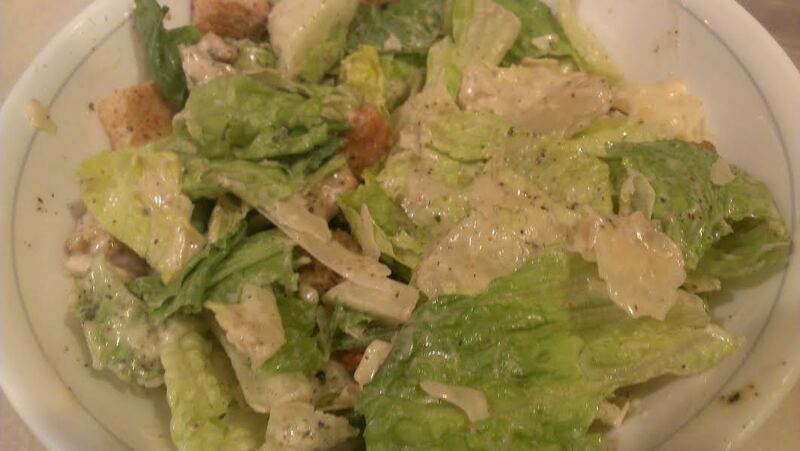 Today, Caesar’s salad is usually comprised of romaine lettuce, croutons, parmesan cheese, lemon, olive oil, egg, Worcestershire sauce, garlic, and black pepper. It is often topped with grilled chicken, steak, or salmon. I happen to love a good Caesar salad…even when it comes out of a bag. And that’s where today’s did. It was delicious nonetheless!